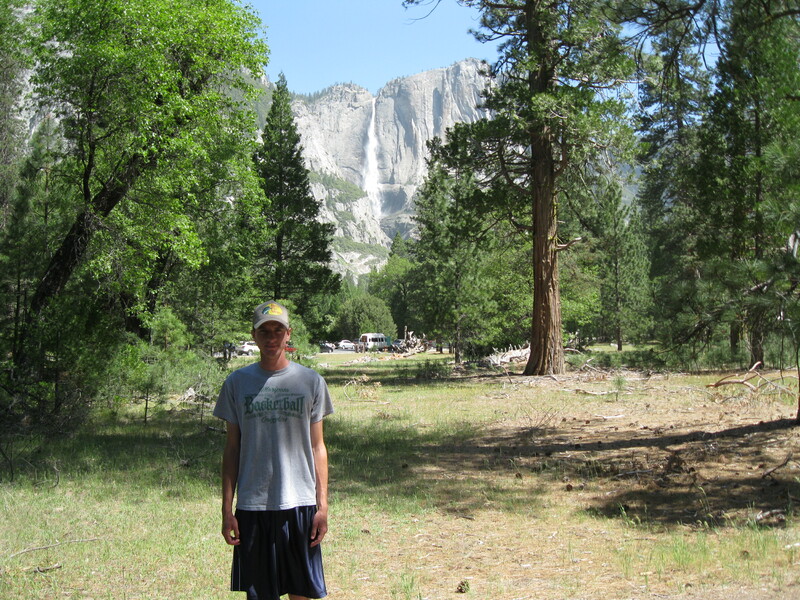 When Andrew came home from college (and before beginning his summer job in Yosemite) we walked the Valley Floor Loop. There were many places to begin. We chose the Eagle Creek pull-out on Northside Drive. 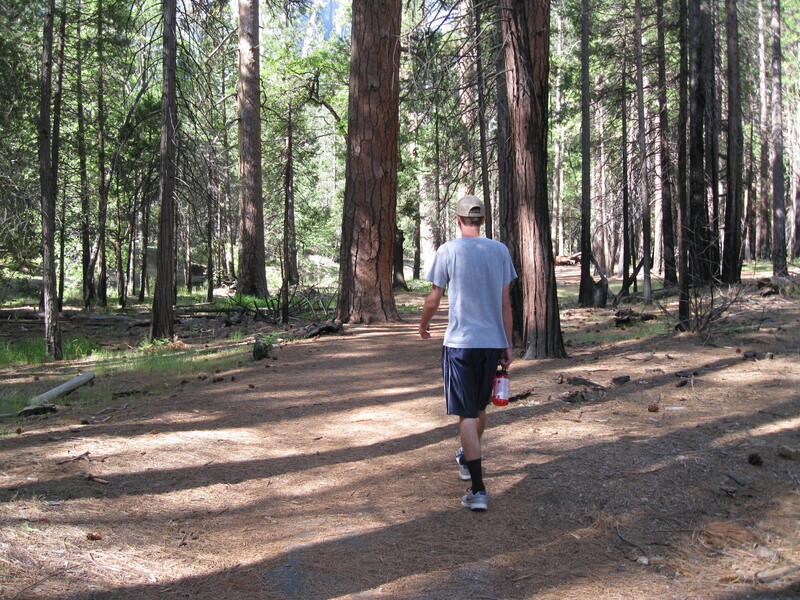 Heading west, we walked through the shaded forest to the sandy bank of the Merced River. 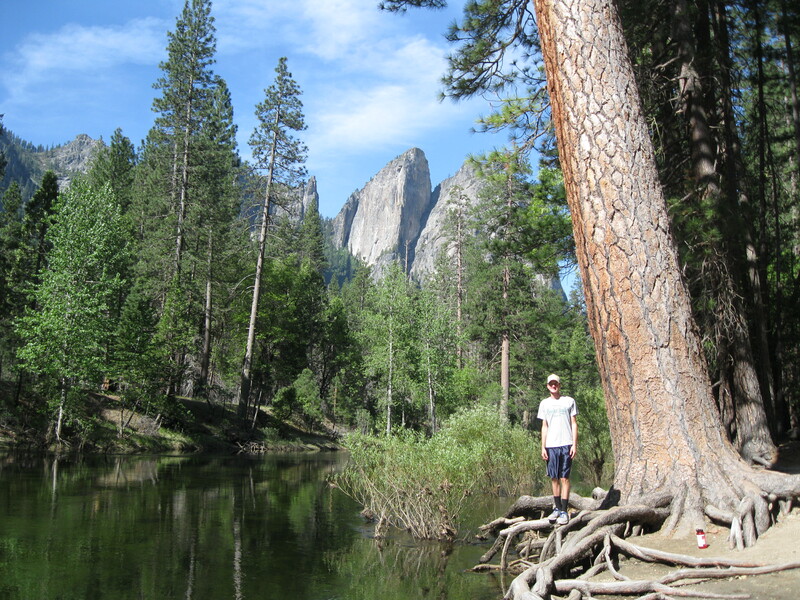 Andrew by the Merced River with Cathedral Rocks in the background. Weaving in-and-out of the mosquito-ridden meadow, we saw tremendous views of Sentinel Rock, Cathedral Rocks, Cathedral Spires, and Three Brothers. Three Brothers in the background. 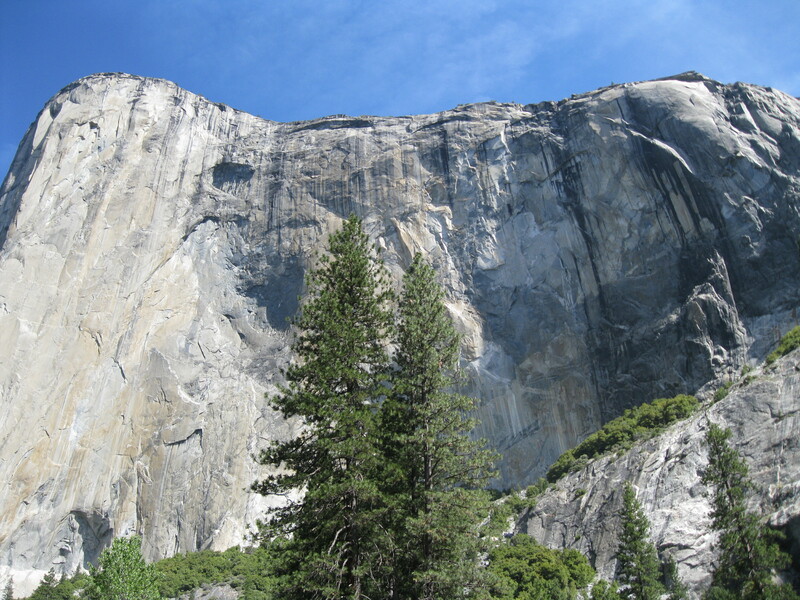 We felt tiny gazing up from the meadow at the giant granite monolith, El Capitan. North of Cathedral Beach with El Capitan as a back drop. There was a riverbank restoration taking place through the Devil’s Elbow area. The park was trying to minimize erosion that years of trampling caused. We did not cross the street as the trail indicated to Bridalveil Fall since we have walked that area before. Here the trail hugged the road. 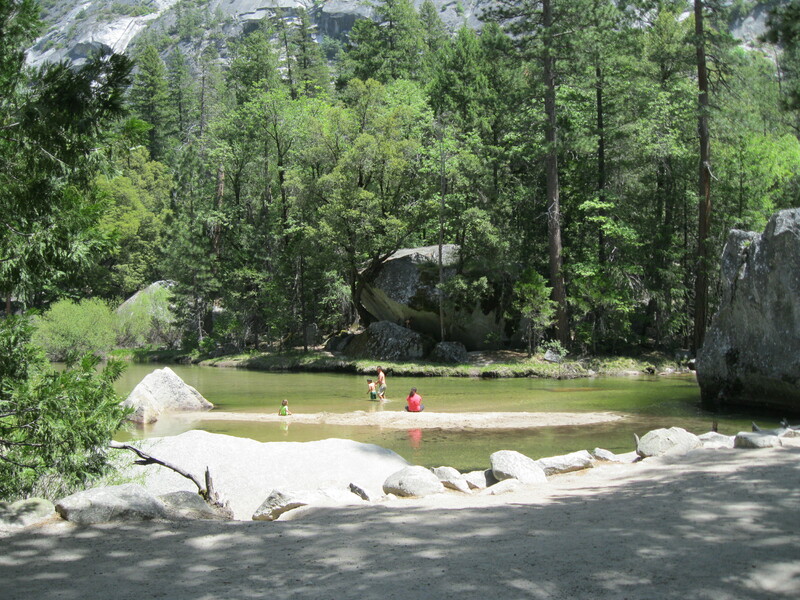 Instead, we crossed the Merced River at El Capitan Bridge and took the pack trail down to the Cathedral Beach area. We crossed Southside Drive and headed back into the forest shooing away more hungry mosquitoes. As we quietly walked along the path, we heard the rush of water from various streams. We heard busy woodpeckers knocking on trees. When the wind blew, a dusting of yellow pollen clouded the air. As we neared the vista points of the grand Yosemite Falls, the area became quite populated and we could see the congested road. Yosemite Falls in the background. We came to the LeConte Memorial, a Tudor-style building named after geologist Joseph LeConte. It was built by the Sierra Club in 1903 and is currently used as a library and education center. From there we took shuttle Stop #12 to the Ahwahnee Hotel where we dined in the bar. 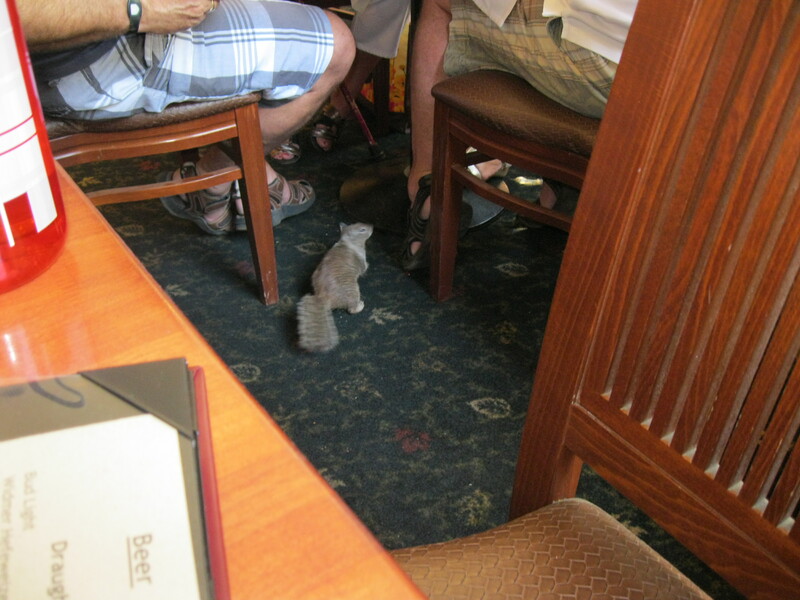 The usual suspect was there: the resident rodent, Mr. Squirrel. After lunch we continued the Valley Floor tour by walking out behind the Ahwahnee on the dirt trail through the spent dogwoods, and over the Ahwahnee and Sugar Pine Bridges. 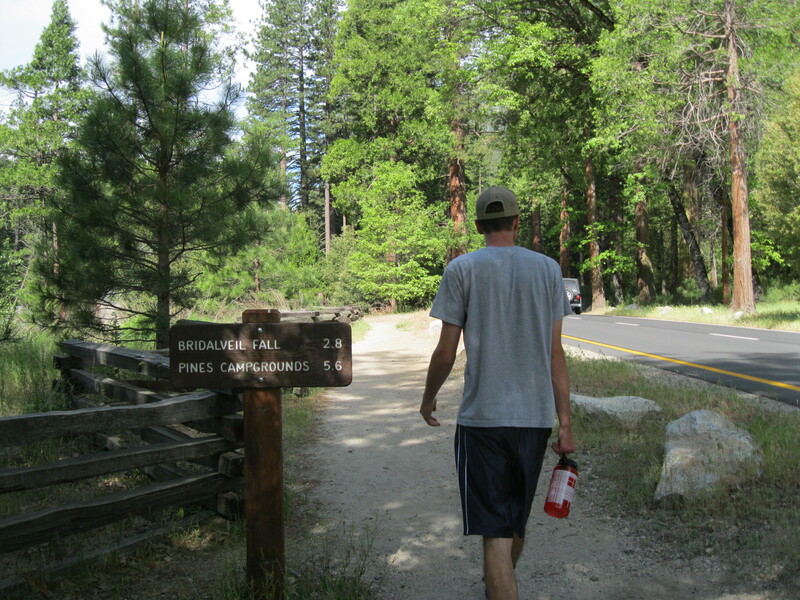 We sauntered through the walk-in Backpacker’s Camp and followed the trail up to Mirror Lake. 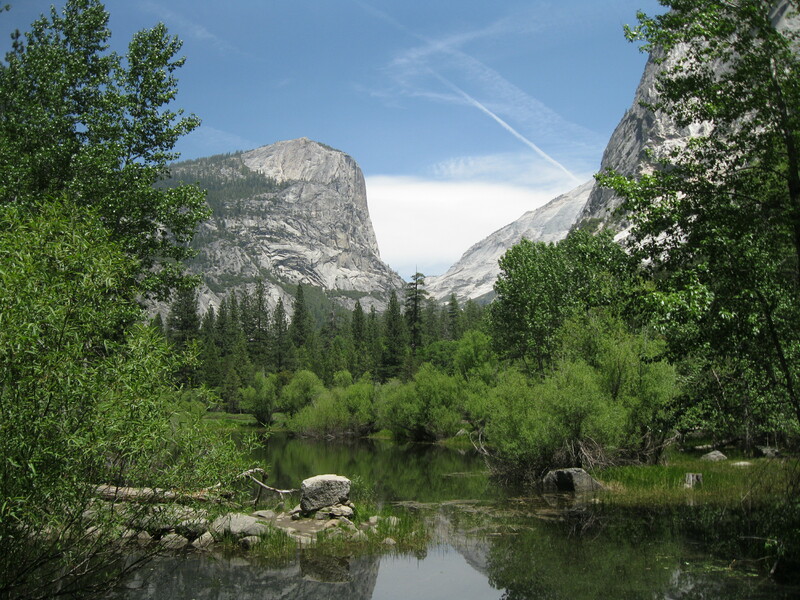 During late summer, Mirror Lake dries up and becomes a meadow. 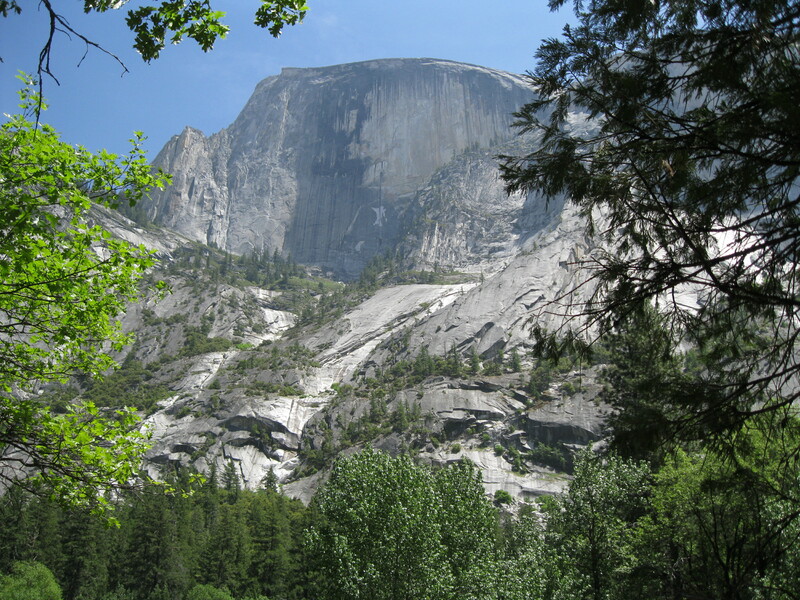 Mirror Lake at the base of Half Dome. From Mirror Lake, the view of Half Dome and Mount Watkins were just as spectacular as this morning’s view on the west end of the park. Mount Watkins on the left. 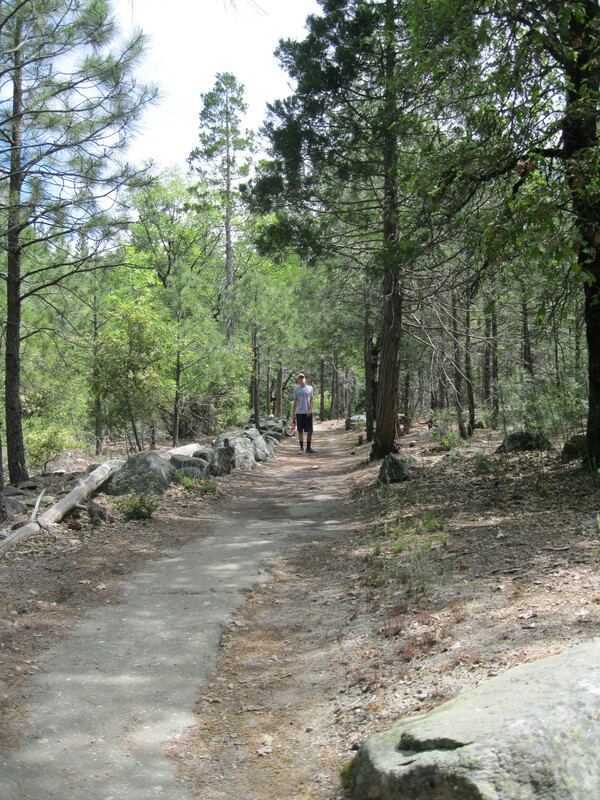 We turned around at the trail sign and walked back on the paved path next to Tenaya Creek, and down to Shuttle Stop #17 where we boarded the bus. 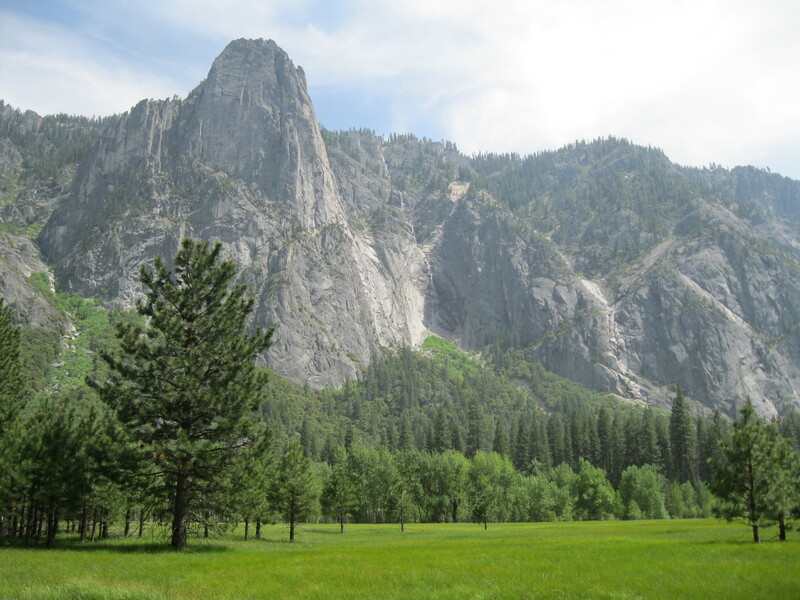 We got off the bus at Stop #7 and walked one mile back to the car skirting Leidig Meadow. 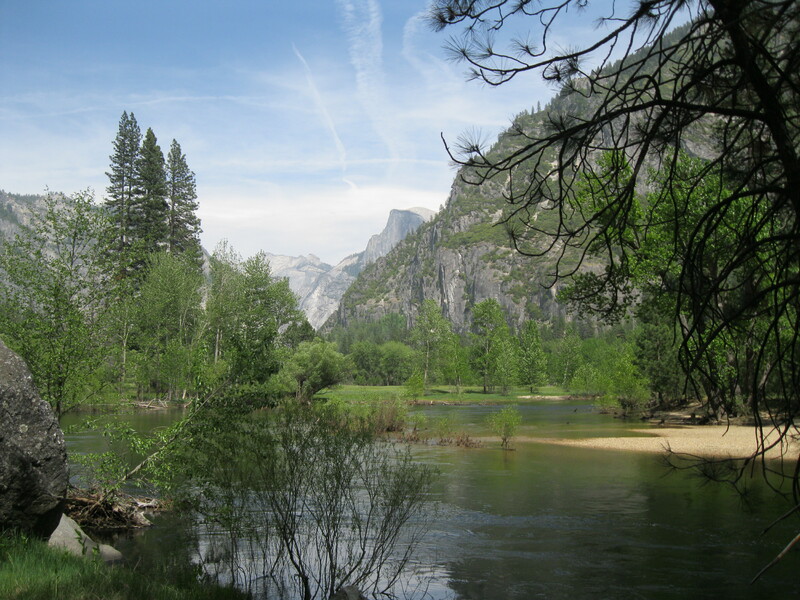 Looking back one last time at the Merced River, and Half Dome in the distance. Although we did not walk the complete 13 miles, we did tour much of the valley on foot. 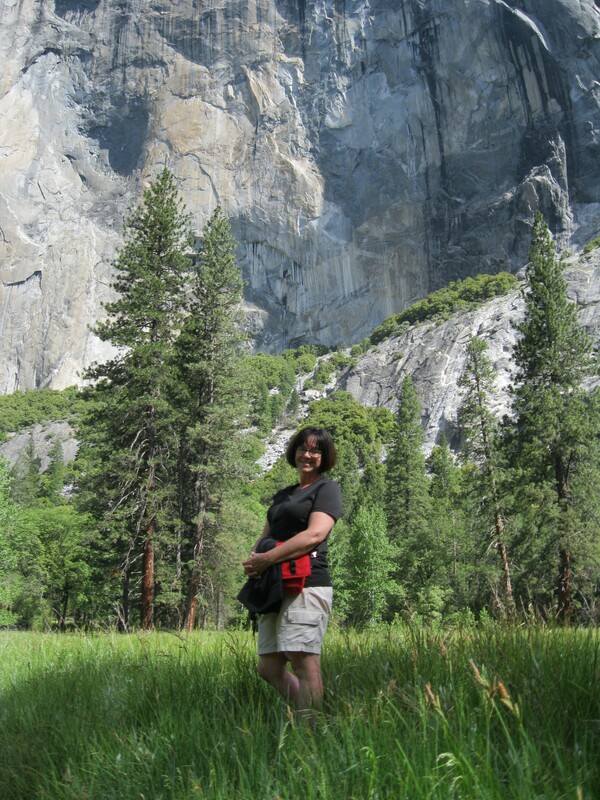 This entry was posted in Yosemite Hikes and tagged Cathedral Rocks, Devil's Elbow, Half Dome, Hiking, Leidig Meadow, Merced River, Mirror Lake, Mt. 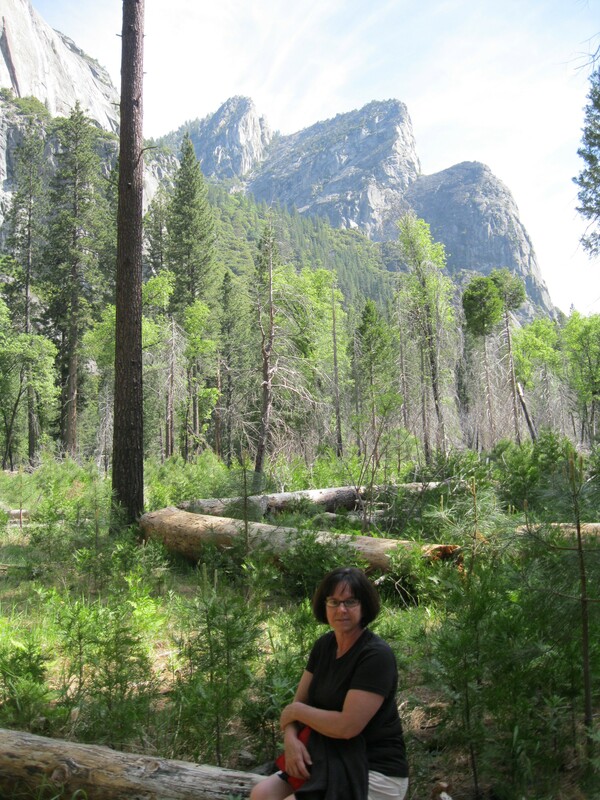 Watkins, Three Brothers, Valley Floor Loop, Yosemite, Yosemite Falls on May 21, 2012 by Janet.